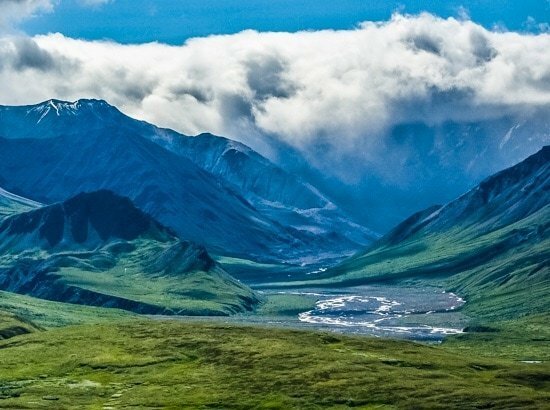 There are plenty of places in the National Parks system which are so remote they require you to want to see them. These are the places that you will not stumble upon accidentally, as getting there is not easy. We have been to several of them. 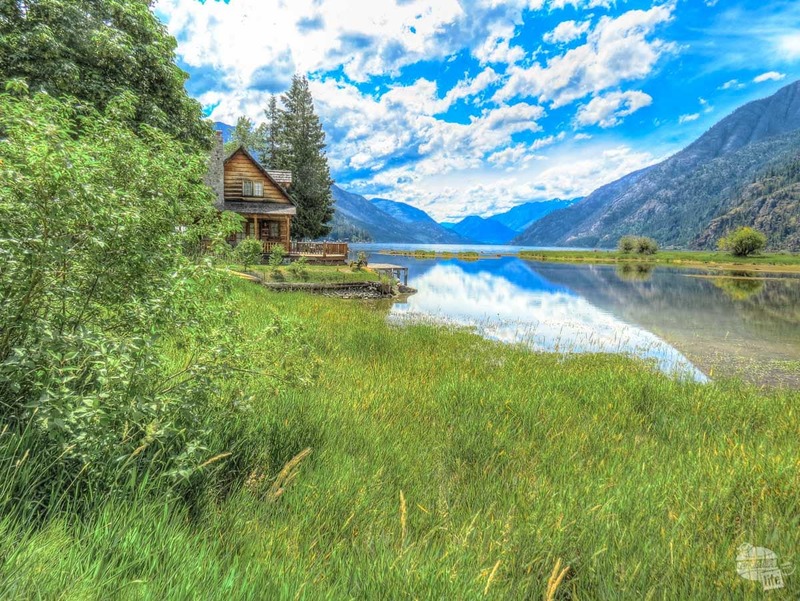 But none of them have the charm or character of Lake Chelan National Recreation Area and the tiny town of Stehekin. This remote corner of the world is home to breathtaking views, a closeness and calmness only found in remote places and a seriously good bakery. In the summer, Stehekin is bustling with hikers, bikers and boaters. 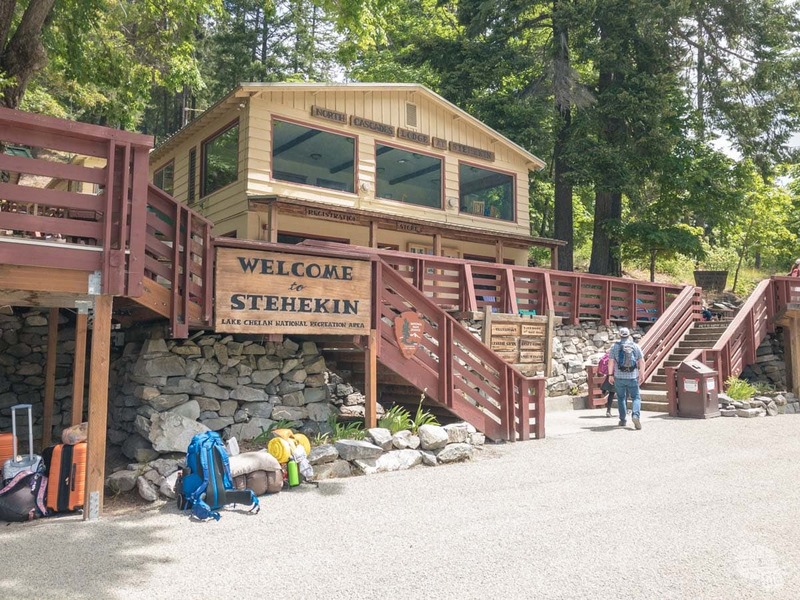 For weary Pacific Coast Trail hikers, Stehekin is the last town before the Canadian border. In the winter, snowshoeing and skiing are popular. Though it swells a bit in the summer, the town only has about 75 year-round residents. There is no road access to Lake Chelan National Recreation Area, the southernmost part of the North Cascades National Park Complex. Stehekin, the hub for the NRA at the north end of the lake, is only accessible by foot, by boat or by floatplane. Getting on the fast boat to Stehekin. 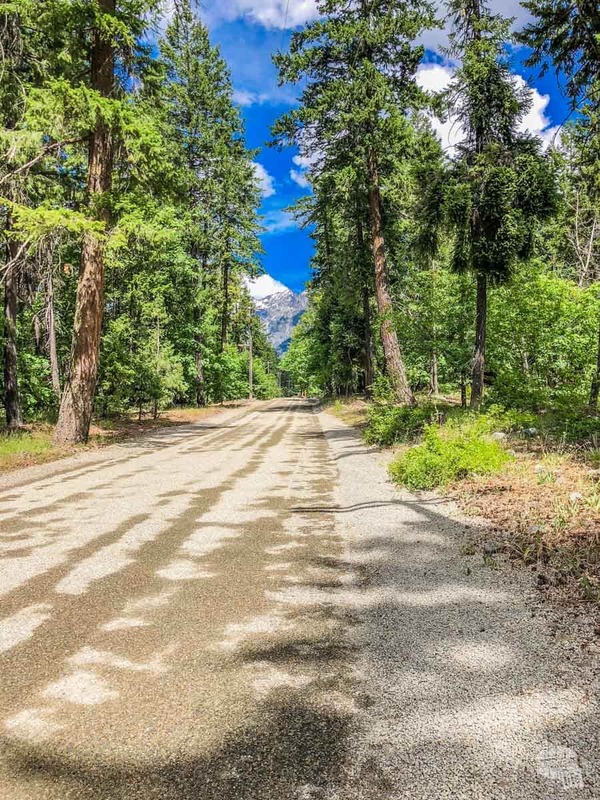 Oddly enough, there are about 22 miles of road once you arrive in Stehekin. 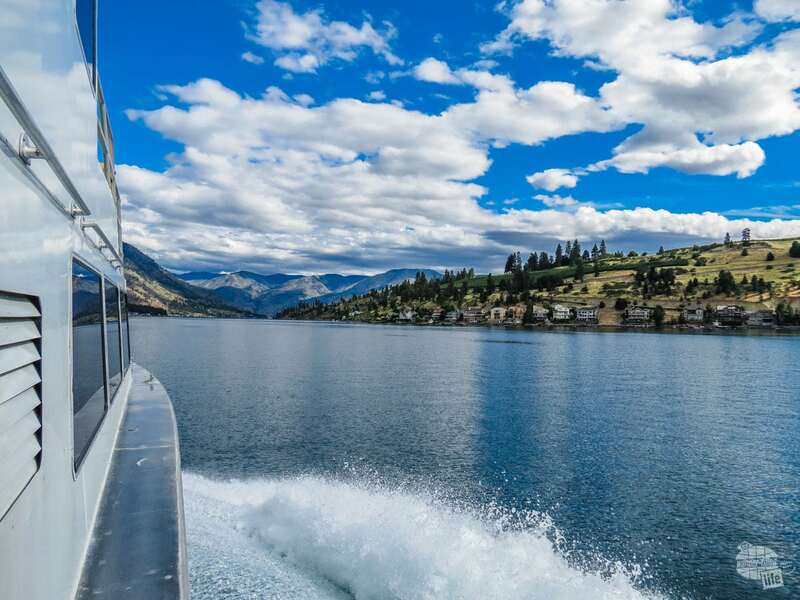 We took the passenger ferry from the town of Chelan, at the south end of the lake. (There are actually two ferries, the Lady of the Lake II, the slow ferry, and The Lady Express, the fast ferry. There are no vehicle ferries. On the ferry to Stehekin in Lake Chelan National Recreation Area. 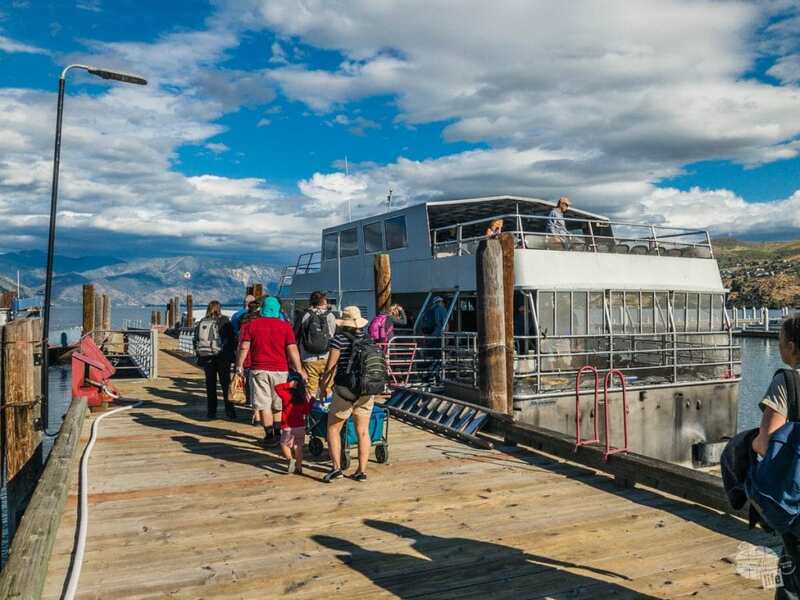 In the summer, each ferry makes one daily round trip up and down the 50-mile long lake, from Chelan to Stehekin. 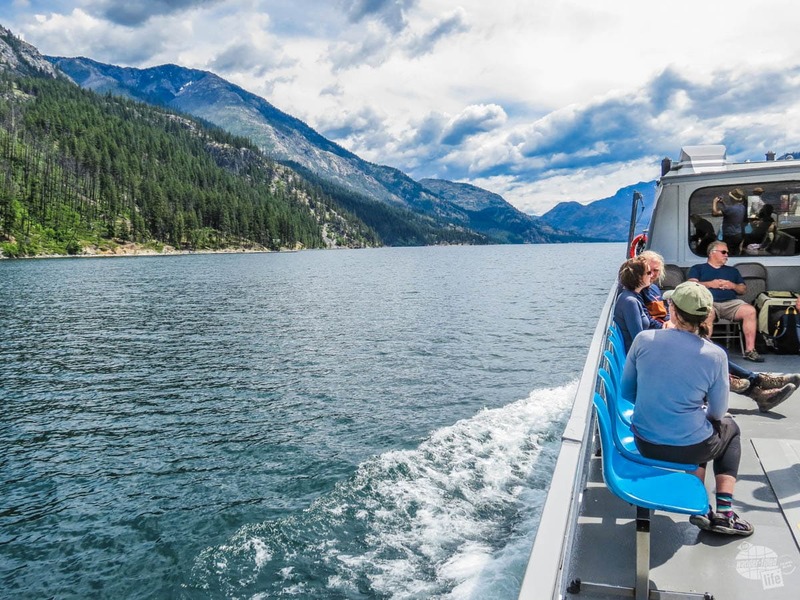 The fast ferry takes about 2.5 hours each way and provides a 60-minute layover in Stehekin. The slow ferry takes about four hours each way and provides 90 minutes in Stehekin. In the height of the summer, your best option for a day trip is the combination ticket, which is what we did. The combination ferry is the fast boat up and the slow boat back. 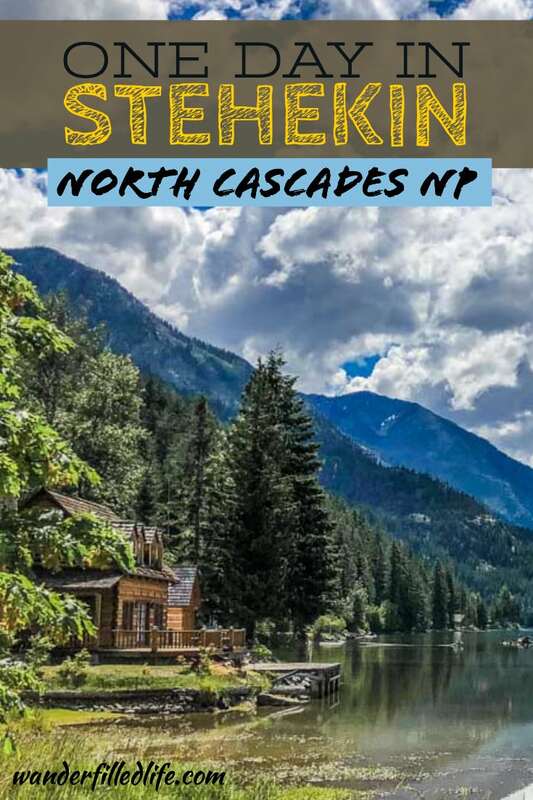 This gave us about three hours to experience Stehekin and Lake Chelan NRA. The ferry ride up the lake was rather interesting. At less than a mile wide, the lake is narrow but deep (third deepest in the US). The folks on the boat did a good job of narrating the trip up, pointing out highlights along the route. Even in June, the weather can be a bit temperamental, so be early to the boat so you can get a spot inside the cabin. While I enjoyed getting out and taking pictures both coming and going, I was glad to have a seat out of the wind. While the fast ferry is, obviously, faster the slower ferry is a little nicer with more comfortable seating and a much better snack bar. Those interested in hiking to Stehekin will have a full-day or more trek with significant elevation change. We did receive the tip that if coming from Rainy Pass (along Hwy 20, just east of the park complex border), much of the hike is downhill. 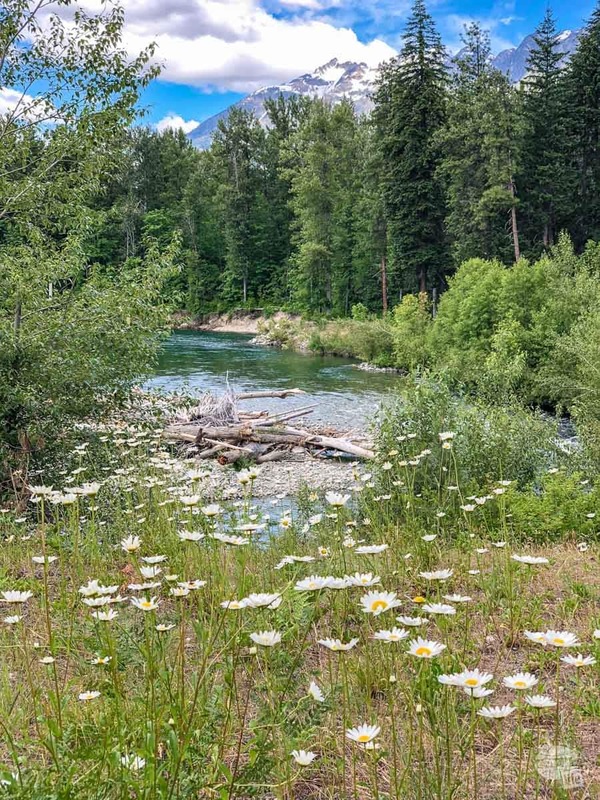 While the idea of hiking to Stehekin is something that I could get excited about, I just don’t think I could handle that much elevation change, up or down. I’d say “maybe someday,” but realistically, hiking isn’t going to get any easier as I get older! 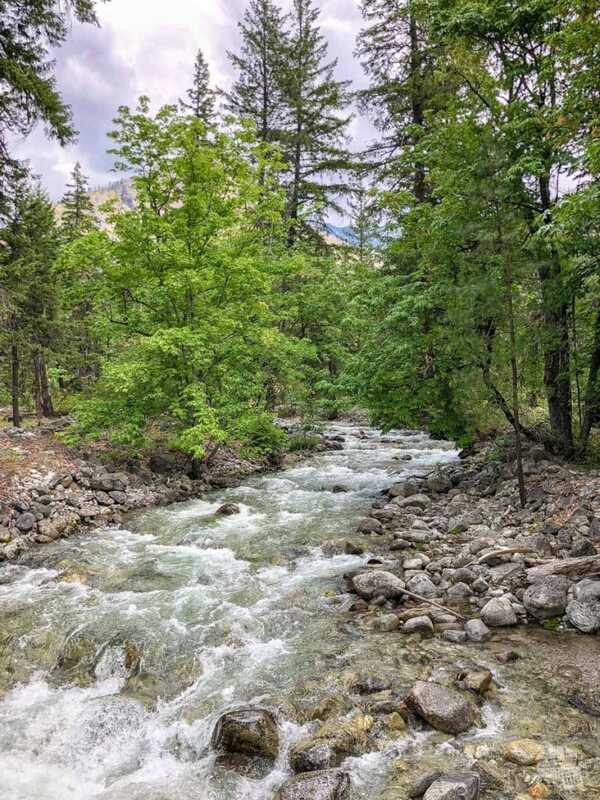 Once you arrive in Stehekin, the terrain is relatively flat, at least the first few miles along the road. The lodge, restaurant and NPS Visitor Center are all located by the marina/ferry dock. In fact, most everything is clustered in this vicinity, right at the north end of the lake. But, there is a road that extends up the valley to several interesting sites. There are vehicles in Stehekin; but they are are only for the locals. A supply barge makes a trip up the lake about once a week in the summer (less often in the winter). Thus, residents can have a vehicle brought in. Considering the road is roughly 22 miles long, a vehicle could be useful if you live outside of town. For visitors, your options for getting around are foot, bike or shuttle bus. I would base your choice on how long you’ll be in town and how far out of town you want to venture. I’ll discuss more about things to see and do in the next section. For now, know that anything out of “town” is more than a mile away. If you have just 60 or 90 minutes, your best bet is to take the shuttle wherever you want to go. If you’ve got 90 minutes, you could rent a bike for an hour, but you still don’t have a lot of time to really explore on your own. With a three-hour layover, we chose to rent bicycles. We figured this would allow us to move around faster than on foot and would still give us the freedom to see and do what we want. For the bike rental, once you get off the ferry, walk past the lodge and down the road until you find Discovery Bicycles on the left. You can’t miss it…but you might think that you have because it is just far enough out for you to start getting concerned. 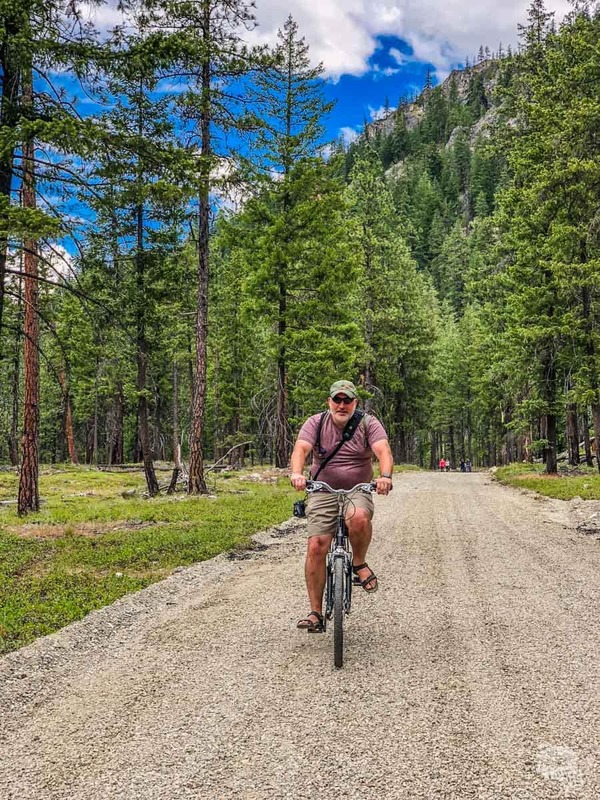 Grant on a bike in Stehekin. Bike rentals are $5/hour. There is also a daily rate and several other options if you are in town for more than just a few hours. For those with the three-hour layover, you’ll typically just be charged $10, since they know you won’t really have three full hours from pick up to drop off. That’s a nice touch! The bicycles were equipped with a small storage pouch. Nothing much, but enough for you to carry some snacks or a small purse. Helmets were complimentary, but not required. The vendor also gave us a map and pointed out a few of the more popular attractions for us. Once we had our bikes, it was time to explore! I’m not going to lie… it took some work to really remember how to ride. We don’t ride bikes often. In fact, I’m not even sure the last time either of us rode a bike. And, no, you don’t forget, but you might have a bit of a tough time getting started and stopping. And you will work muscles you forgot you had. Also, we struggled on the minor uphills on the bikes. Not much, but enough to where we realized we really needed to relearn how the gears on a bike work. We felt better when we ran into some other folks who felt the same way. 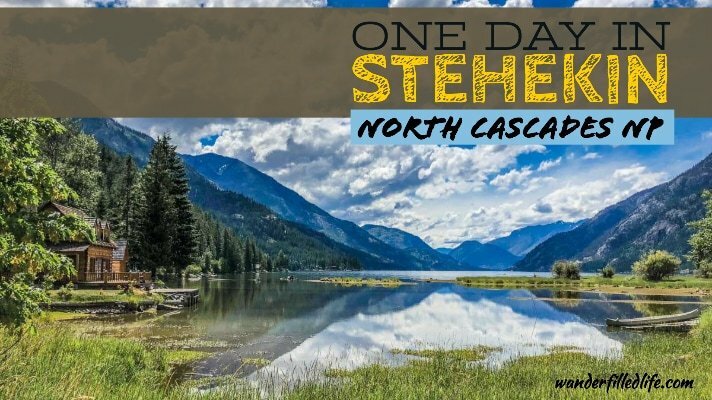 Most of the things to do in Stehekin revolve around exploring outdoors. 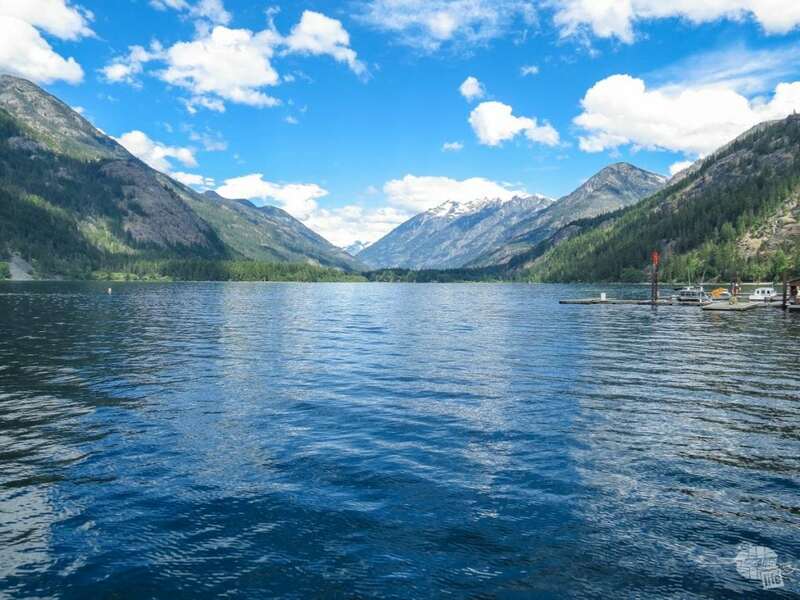 Some of the activities you’ll find in Stehekin include hiking, biking, boating, fishing and horseback riding. You’re certainly not going to find a bowling alley or movie theater around here. Heck, the town didn’t even have telephone lines until 2007. And there is zero cell service. Also, no ATM and only one public satellite phone. Yep, you come here to get away! If you travel down the road you will find quite a few interesting sites that will easily keep you busy for a few hours or even a full day. The shuttle will take you to some of these sites, but does not necessarily stop at all of them. Our first stop was the old Stehekin Schoolhouse. The Stehekin School serves K-8, even today. For high school, students must either be home-schooled or move to another town. Until 1988, they used a small two-room cabin. This worked for the handful of students. The school district built a new building, just down the road, in 1988. 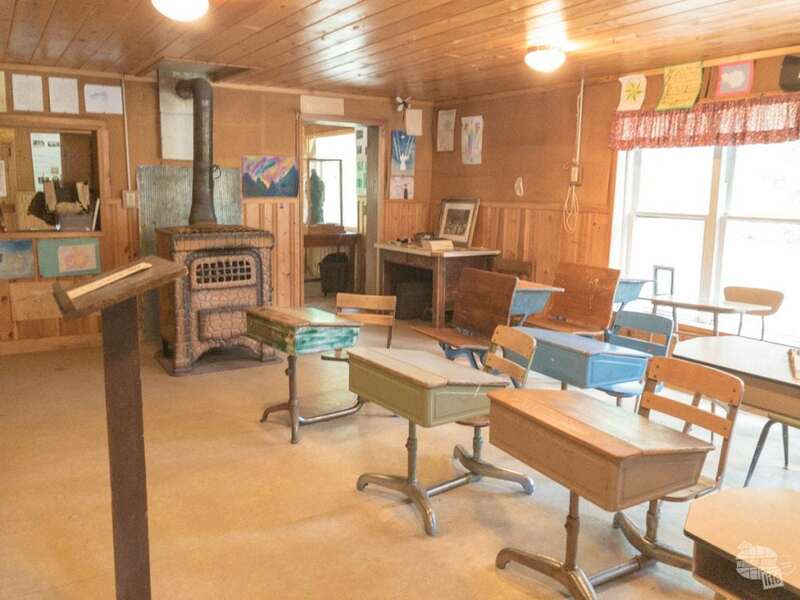 While larger, the new school is still considered a one-room schoolhouse. There is still only one teacher, though there are quite a few volunteers to assist. 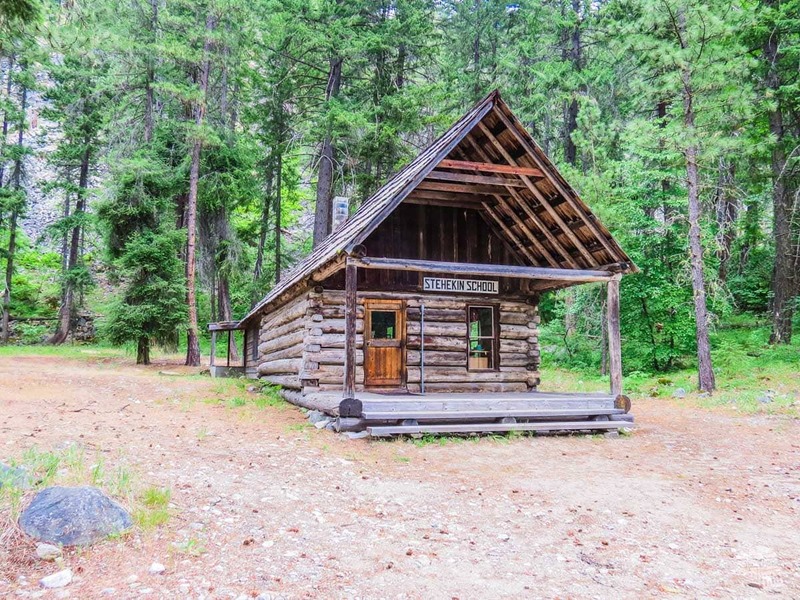 This two-room schoolhouse in Stehekin was the only school for grades K-8 until 1988 when a new school was built. We find this tiny school district a bit fascinating. 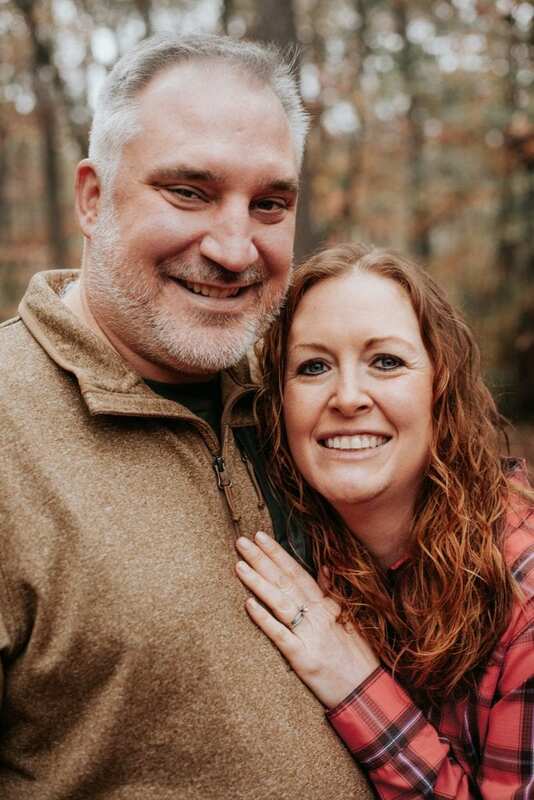 Between the two of us, we teach around 250 students a year. Our school graduated 500 this past May. So, there is a fascination with how tiny schools like this operate, especially meeting modern standards. Beyond the school is the turnoff for Rainbow Falls, one of the main attractions relatively close to town. The waterfall is easily visible with just a short walk from the parking area. Rainbow Falls is rather tall (312 feet) and quite beautiful. It is easily worth the ride out and the views are magnificent. Be prepared for a bit of mist, especially in early summer when there is still a lot of snowmelt. Rainbow Falls is about three miles north of Stehekin. Apparently, there is a short, but steep trail up the hillside for a view from a little higher up. We did not do this. Actually, we didn’t even see the trail, but we also didn’t look for it. 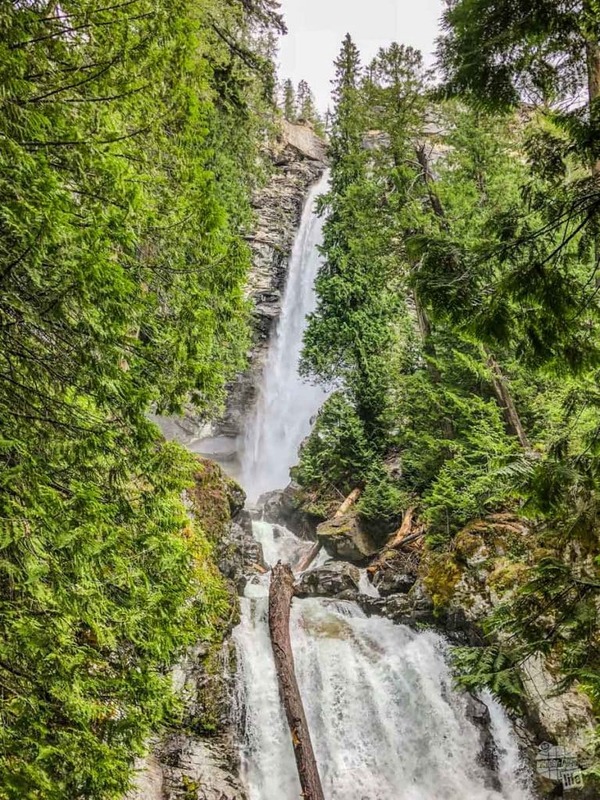 The Stehekin Shuttle provides a 50-minute tour to Rainbow Falls if you are interested in seeing it on a short stay. Oh man, what a delightful lunch! This is why you visit Stehekin. Seriously, if you don’t do anything else you have to stop at this cute little bakery! The shuttle will take you there, so you have plenty of time to visit even on a 60- or 90-minute layover. We decided to save it for our way back into town, but it’s actually located closer to town than the falls or the schoolhouse. Honestly, we were just trying to avoid the shuttle bus full of people that headed that way when we got off the ferry! The sandwichs at the bakery in Stekhekin were hearty. The pasteries were delicious. The bakery serves sandwiches, pizza, quiche, lots of different pastries and ice cream. For a place almost literally in the middle of nowhere, the options are tremendous, the service was good and the food was delicious! We both had outstanding, hearty sandwiches. Grant built his own and I opted for the Rueben, which was the special of the day. For dessert, we really wanted to get some huckleberry ice cream. But, alas, we needed to head back to town and couldn’t bike and eat at the same time. This is where the storage pouches on the bikes really came in handy! We opted for a couple of pastries to go, which we saved for the boat ride back. Back in town, after returning our bikes, we stopped at the Golden West Visitor Center. We got a few tips for our visit to North Cascades National Park and Ross Lake National Recreation Area the following day. Grant, of course, picked up a magnet. The North Cascades Lodge at Stehekin is popular stop off for folks hiking the local trails, as well as folks just looking to get away. We still had a few minutes, so we looked around at the souvenir store. While we did get a magnet and sticker, we really are kicking ourselves that we didn’t get a shirt or some other memorabilia. This visit to Stehekin and Lake Chelan NRA truly was the highlight of our entire North Cascades NP Complex visit. And it had the best option of souvenirs. Unfortunately, we didn’t realize that until it was much too late to return. Finally, we found a chair and simply relaxed, enjoying the views and quiet of Stehekin. This was just a brief taste of Stehekin and we know it. If you decide to do the day trip, like we did, be sure to bring cash with you. While we were able to use our credit cards in a couple of places, not everywhere takes it. There is no ATM in the town. Also, bring a book for the boat, especially the slow boat. Despite how entertaining the crew was, four hours is a long time. The back deck of the slow boat is more open air and offers better picture-taking opportunities. One final thing for the folks doing the day trip: be prepared to want to spend more time here. Three hours was not nearly enough. 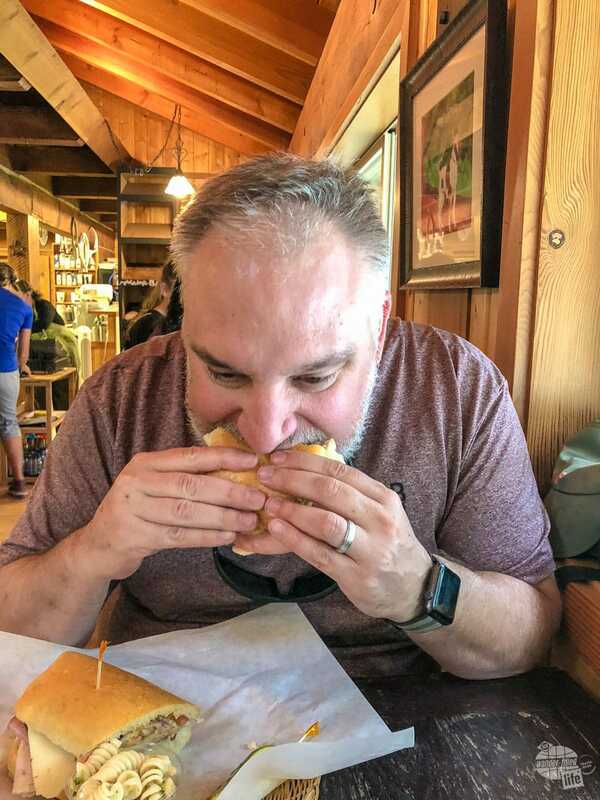 We missed seeing some really cool stuff because we didn’t have the time, like the Buckner Homestead District and Orchard, with a cabin dating back to 1889. The thing about Stehekin is the feeling of the place. It is simple, quiet and out of the way, but at the same time, it is full of so many things to do. You can get out on the lake in a kayak. You can go fishing, There are a ton of hiking trails. There is a ranch up in the valley which offers horseback riding, not to mention accommodations and food. We are really looking forward to going back for a long weekend and staying in the lodge. This is the perfect place to unplug and relax. Enjoy this story? Be sure to pin it on Pinterest and share it to Facebook and Twitter! 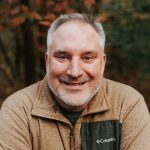 A native of Georgia, Grant has decided to put his love for travel and nature photography, coupled with years of experience in print journalism, to good use and start Our Wander-Filled Life with his wife, Bonnie. 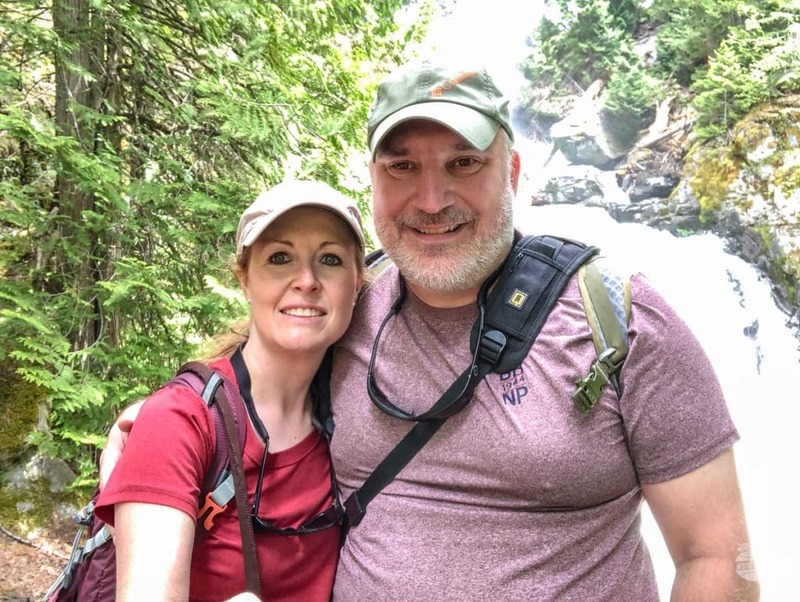 We are Grant and Bonnie Sinclair, a couple of 40-something teachers with a passion for travel. It doesn’t matter what kind: plane, train, boat or our trusty truck and camper. Together we have been to 20 foreign countries, 45 states and 202 units of the National Park Service since 2009. Subscribe to our monthly newsletter and get our best posts and pictures from the month. Your Information will never be shared with any third party. Our promise to you.